Have you ever been to a sporting event where the mascot and other cheerleaders shoot t-shirts and toss hot dogs into the crowd during lulls in the action? Fun for the whole family, right? Well thanks to a ruling from the Missouri Supreme Court, don’t be surprised if this tradition becomes a thing of the past. In a unanimous ruling last month overturning a local jury’s verdict in favor of my hometown Kansas City Royals, Judge Paul C. Wilson and his Missouri Supreme Court colleagues decided, as a matter of law, that the risk of being injured by a hot dog toss is not one of the risks inherent in watching a Royals home game at Kauffman Stadium. John Coomer v. Kansas City Royals Baseball Corporation. You’ve got to be kidding me. Baseball and hot dogs go together like mom and apple pie. At a professional baseball game where balls, broken bats, and even fielders fly into the stands, and patrons must be alert at all times to avoid injury, the risk of being injured by a flying hot dog is somehow excluded? That decision defies logic and common sense. A baseball game is not merely about what happens during the contest. It is a full-scale entertainment experience. For the prices that major league teams charge for games these days, they have to offer more entertainment than just the action between the lines—however thrilling this season is for long-suffering Royals fans. In the (hot) dog days of summer, baseball fans assume the risk of the sideshow right along with the main event. Frequent spectator John Coomer allegedly suffered a detached retina when he failed to see a free hot dog coming his way. That is no laughing matter. And so he sued. 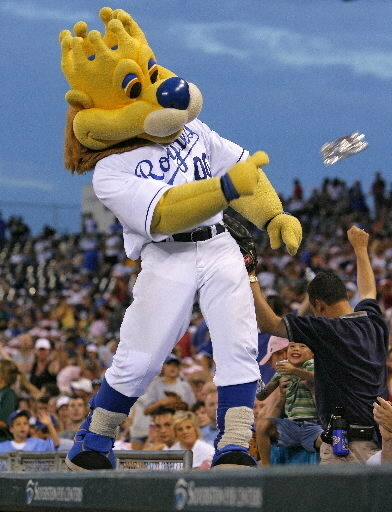 But the antics of Sluggerrr, the adorable lion mascot who was not around when I was a kid—including his tossing free hot dogs to fans in the stands—is very much a part of today’s entertainment package. Don’t believe me? I asked two experts, namely my two mascot-adoring, elementary-school-aged kids, about the court’s fuddy-duddy observation that “safety always can be ensured simply by handing the food to the customer.” “But that takes all the fun out of it!” they protested mightily. Guess which state supreme court isn’t smarter than your average fifth grader? Where the Court Went Wrong in Three Strikes. Let’s break this down and see where exactly the Court went wrong as a legal matter. The Court began by considering the status of the ‘assumption of risk’ affirmative defense in a comparative fault tort regime like Missouri’s. It distinguished between implied primary assumption of the risk (in which a plaintiff implicitly consents based on his conduct and the surrounding circumstances to assume a known and understood risk that was not created by the defendant’s negligence) and implied secondary assumption of risk (in which a plaintiff unreasonably implicitly consents to assume a known and understood risk that did result from the defendant’s negligence). The court held that Missouri’s version of comparative fault allows primary (and express) assumption of risk affirmative defenses but excludes secondary assumption of risk affirmative defenses, because a jury should assess the plaintiff’s unreasonable decision in the context of deciding comparative fault. Unlike in a contributory negligence regime, where a plaintiff’s unreasonable behavior bars recovery, in a comparative fault regime the Court says that a plaintiff’s unreasonable assumption of risk can vastly reduce (even to near zero) but not, it seems, completely bar a plaintiff’s recovery. The Baseball Rule has been expanded at various times and places to cover all spectators, regardless of whether they are fully cognizant, other sporting events, etc. It could easily have been applied here. The hot dog was tossed by hand in the customer’s direction, and he failed to see it coming. I should point out that Mr. Coomer was not even sitting in the seat he paid for. Rather, because attendance was low that day, he moved down to a much better seat that was six rows behind the third-base dugout. By moving closer to the action, he improved his view of the game—and the entertainment—and improved his odds of getting hit by a batted ball (which may have been worse for Mr. Coomer but better, legally speaking, for the Royals) or snagging a free hot dog in the process. Mr. Coomer had been to many previous games, and he even admitted that he saw the mascot about ready to toss the hot dog from the roof of the dugout but turned his head away before seeing it heading in his direction. A trial judge hearing all of these facts would surely have been well within his rights to find implied primary assumption of risk by the defendant. Instead, the Court eliminated that option and decided as a matter of law that the rule does not apply because the risk of being injured by a hot dog is not an inherent risk of watching a baseball game. That’s strike one for the Court. Next, at a minimum, a judge hearing all of these facts would surely be well within her rights to find implied secondary assumption of risk as a successful affirmative defense for the Royals. But the Court also took that option off the table by deciding that such an affirmative defense, which did exist at common law in Missouri, did not survive the switch to comparative fault. So, Missouri juries can no longer consider an affirmative defense because the jury has to compare fault between the two parties. Strike two for the Court. Finally, a jury hearing all of these facts would surely be well within its rights—even under a comparative fault rule—to find for the Royals. Why such a comparison couldn’t still generate a decision that the plaintiff bore all the fault, the Court does not explain. It seems to rely heavily on the fact that the jury found no fault on the part of the Royals (which the Court clearly disagreed with) to conclude that the instructions must have misled the jury to apply the affirmative defense on top of the comparative fault rule. But the law of comparative fault surely does not hold that the jury must always return a verdict that gives at least some amount of recovery to the plaintiff. In any case, the Court cut off this option as well. The trial judge gave instructions to the jury that could possibly be construed as (but would not necessarily have to be construed as) saying that the Royals get the benefit of the affirmative defense even if the jury finds some comparative fault on the part of the Royals. Because the Court held that the affirmative defense was not available as a matter of law, and the trial judge arguably let the jury decide the question, the Court ordered a retrial. Of course had the Court decided that the jury shouldn’t have decided the legal question—but that the jury got it right—then it could have ruled that there was harmless error. Only because the Court believes the jury got its verdict wrong as a matter of law was it forced to order a retrial. And that’s strike three. When the Court Blows a Call, There is No Joy in Mudville. Aside from being wrong on the law, this decision is a colossal waste of state and private resources. The jury already considered all the facts of the case. The judge also considered all the facts of the case. The judge declined to order a directed verdict. The jury said the Royals were not even a little bit at fault. This smacks of a do-over because the judges are second-guessing the outcome of the case. That is jury nullification of a new and even more pernicious sort. The wisdom of the jury was brought to bear in this case, and the jury decided that it did not believe a baseball team should be liable for hot dog injuries like this one in the stands. The Court’s hubris in overturning that commonsense decision is stunning. Bad legal decisions like the one rendered here have a nasty way of taking the fun out of life. The U.S. Constitution instituted trial by jury not only as a bulwark of the defendant against the state, but also as a way to inject common sense into court proceedings. The facts were not complicated here. The jury heard the evidence and decided that the Royals were not negligent. Had the mascot been, say, firing the air gun at close range, or had the gun malfunctioned in some way, we might well have a different case. But that’s not what happened here. The hot dog was tossed by hand. Sadly I haven’t been to a KC Royals game recently, but I did attend the Kansas City Chiefs game at FedEx Field last year when they thrashed the Washington Redskins. If you saw the game, you will recall that the weather was so wet and cold that by the time the Chiefs had run up the score at halftime, most Redskins’ fans had left. And many of the fans who stayed retreated to the concourses. Why mention this? Well, when the victorious Chiefs finally left the field, several of them stopped to throw wristbands and other pieces of their uniforms to fans in the first rows of the stands as a kind of thank you to the diehards who stayed until the bitterly cold end and out-cheered the home team’s own crowd. That is the kind of generous, sportsmanlike gesture that the law should reward, not discourage. Any jury would see the wisdom in that immediately. Yet I can only imagine how the Missouri Supreme Court would deal with the case of the flying wristband. Good grief did the Missouri Supreme Court ever mess this case up—Royally! EPA’s “Waters of the U.S.” Proposal: Coming Soon to a Back Yard Near You?